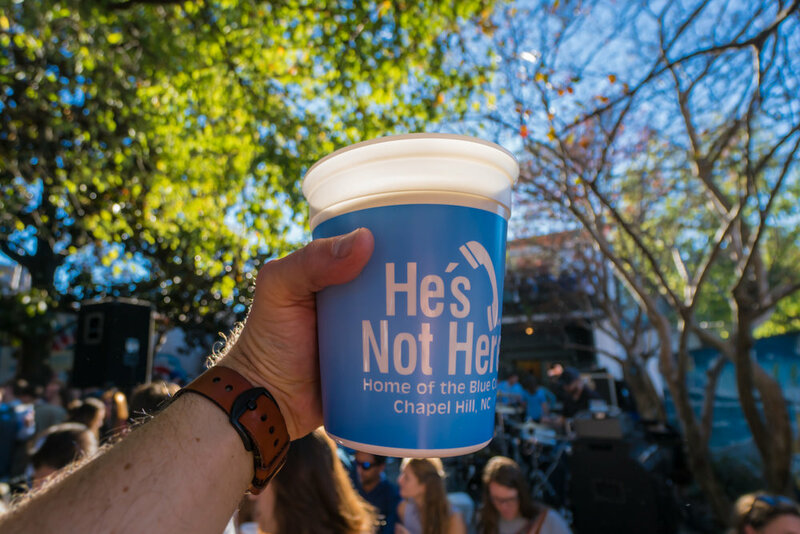 If you've ever been to Chapel Hill, this post needs no explanation. If you haven't, I'll explain. He's Not Here is an institution. Whenever a UNC basketball star announced that he'd be leaving Chapel Hill for the NBA, he would be seen at He's Not with none other than Michael Jordan the night before the announcement. Michael was always called in to have a heart-to-heart with the player before the big decision. Rumor had it that his advice was always that if they did leave, they needed to take classes during the summer until they earned their degree. Either way, if you saw your favorite UNC player at He's Not with Michael Jordan, it was bad news for the Tar Heels... but you got over it quickly because you were drinking cheap beers out of these enormous Solo cups. "Back in our day" they were simply giant blue cups... and were called "Blue Cups"... at some point the Solo company stopped making them in blue and there was an awkward period where "Blue Cups" were actually "White Cups." It didn't take long for these next-generation screen-printed cups to show up. They're a little too fancy for He's Not Here but I don't see anybody complaining.